Download "Outlook Web Application (OWA) Basic Training"
1 Outlook Web Application (OWA) Basic Training Requirements to use OWA Full Version: You must use at least version 7 of Internet Explorer, Safari on Mac, and Firefox 3.X (these two achieve 99 percent feature availability). If you are using Google Chrome or Internet Explorer version 6, you will default to OWA Light. 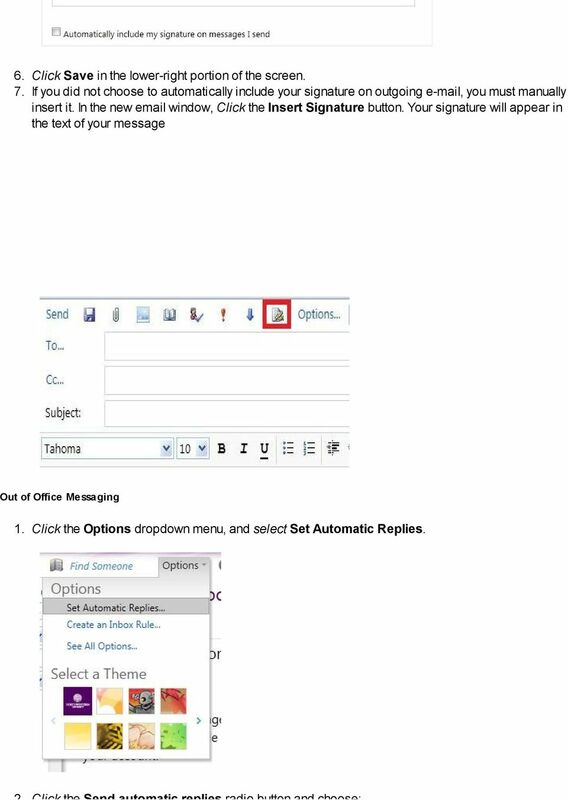 What is Outlook Web App 2010? 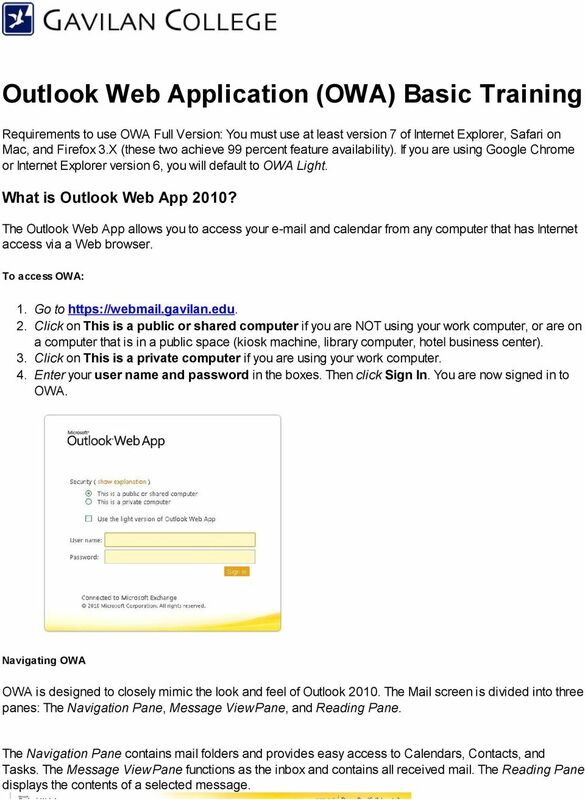 The Outlook Web App allows you to access your and calendar from any computer that has Internet access via a Web browser. 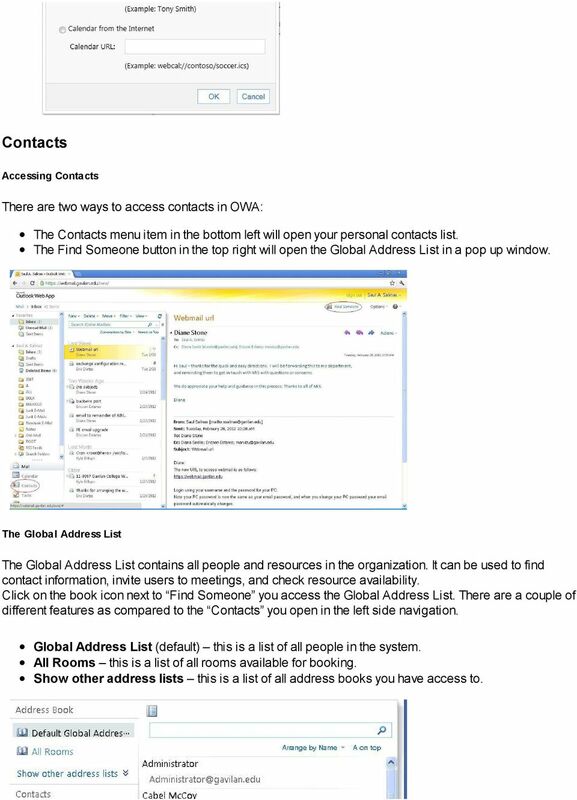 To access OWA: 1. Go to 2. Click on This is a public or shared computer if you are NOT using your work computer, or are on a computer that is in a public space (kiosk machine, library computer, hotel business center). 3. Click on This is a private computer if you are using your work computer. 4. Enter your user name and password in the boxes. Then click Sign In. You are now signed in to OWA. Navigating OWA OWA is designed to closely mimic the look and feel of Outlook The Mail screen is divided into three panes: The Navigation Pane, Message View Pane, and Reading Pane. The Navigation Pane contains mail folders and provides easy access to Calendars, Contacts, and Tasks. 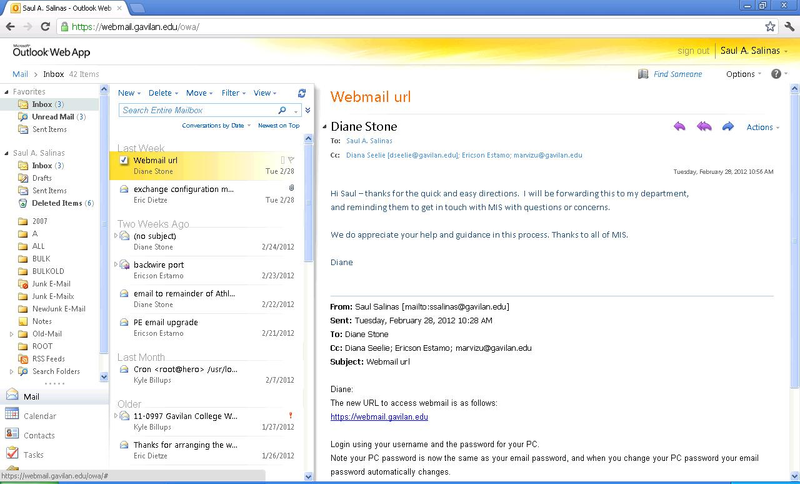 The Message View Pane functions as the inbox and contains all received mail. The Reading Pane displays the contents of a selected message. 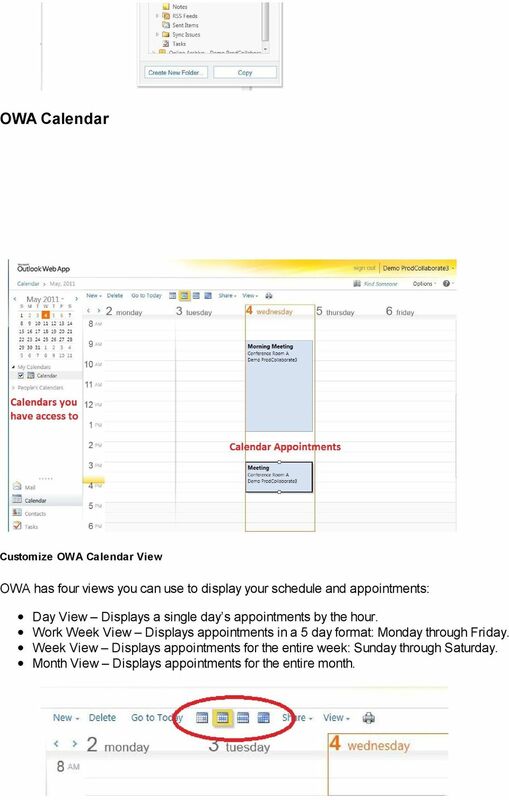 2 Sections of OWA Click on the selection tab to access the various tools in OWA Mail Compose, send, read, and reply to s. Calendar Create and manage appointments and meetings. Contacts Manage and store contact information. Tasks To-do items with optional reminders. 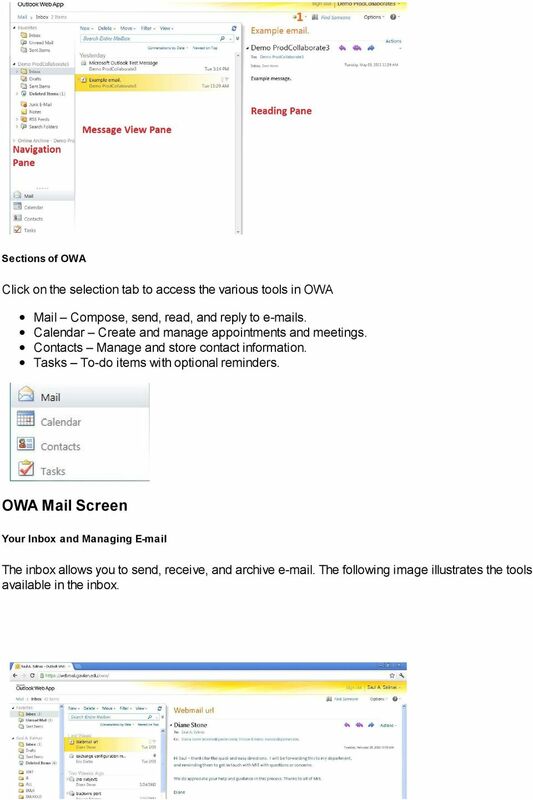 OWA Mail Screen Your Inbox and Managing The inbox allows you to send, receive, and archive . The following image illustrates the tools available in the inbox. 3 Sorting Messages To sort your messages: 1. Click Conversations by Date. 2. Select the criteria you wish to sort by from the Drop Down List. Creating/Sending Messages To create a message 1. Click on the New button in the toolbar and choose Message. 2. Type an address in the To: field. If you have sent a message to this address before, the Auto Complete feature will display the address. Click on the displayed addressto auto-populate the To: field. 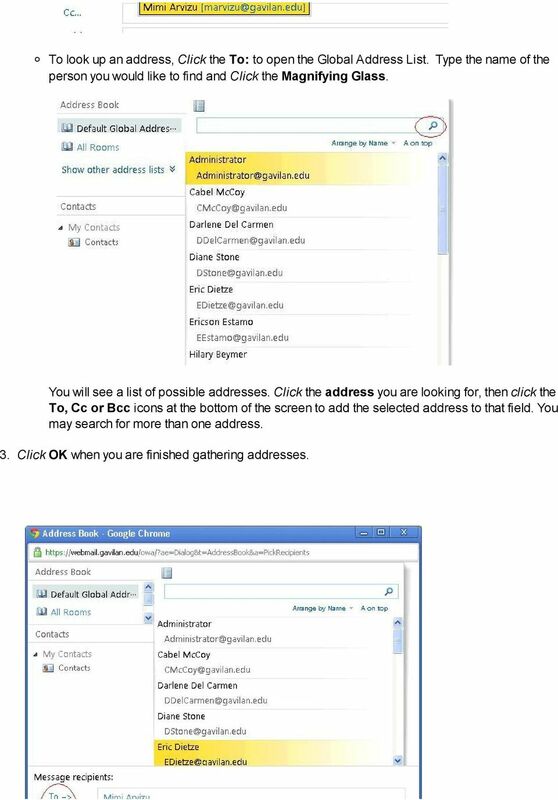 4 To look up an address, Click the To: to open the Global Address List. Type the name of the person you would like to find and Click the Magnifying Glass. You will see a list of possible addresses. Click the address you are looking for, then click the To, Cc or Bcc icons at the bottom of the screen to add the selected address to that field. You may search for more than one address. 3. Click OK when you are finished gathering addresses. 5 4. 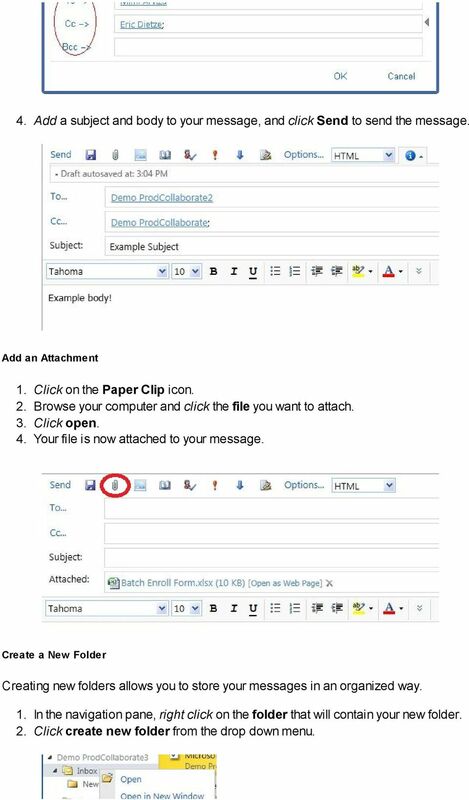 Add a subject and body to your message, and click Send to send the message. Add an Attachment 1. Click on the Paper Clip icon. 2. Browse your computer and click the file you want to attach. 3. Click open. 4. Your file is now attached to your message. 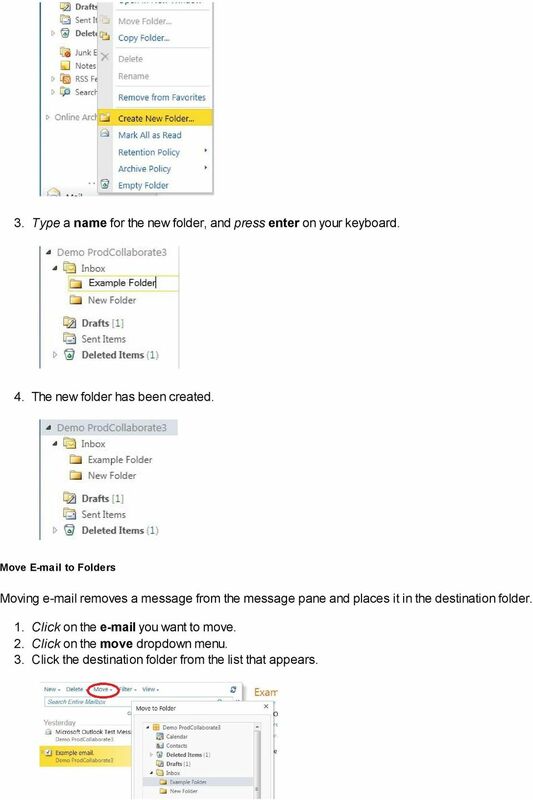 Create a New Folder Creating new folders allows you to store your messages in an organized way. 1. 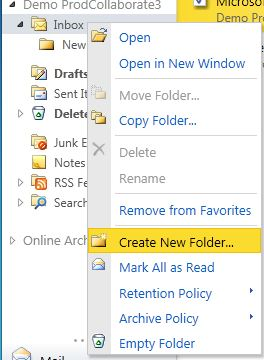 In the navigation pane, right click on the folder that will contain your new folder. 2. Click create new folder from the drop down menu. 6 3. Type a name for the new folder, and press enter on your keyboard. 4. The new folder has been created. 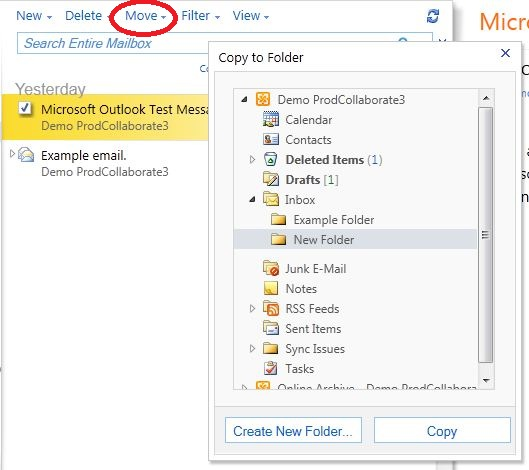 Move to Folders Moving removes a message from the message pane and places it in the destination folder. 1. Click on the you want to move. 2. Click on the move dropdown menu. 3. Click the destination folder from the list that appears. 7 OR 1. Drag and drop the you want to move into the destination folder. 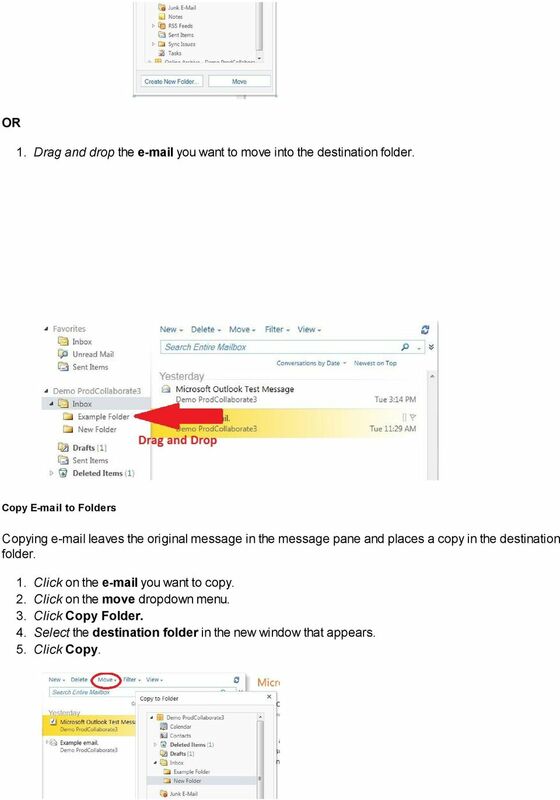 Copy to Folders Copying leaves the original message in the message pane and places a copy in the destination folder. 1. Click on the you want to copy. 2. Click on the move dropdown menu. 3. Click Copy Folder. 4. Select the destination folder in the new window that appears. 5. Click Copy. 9 Adding an Appointment 1. Click New on the Calendar Toolbar. 2. 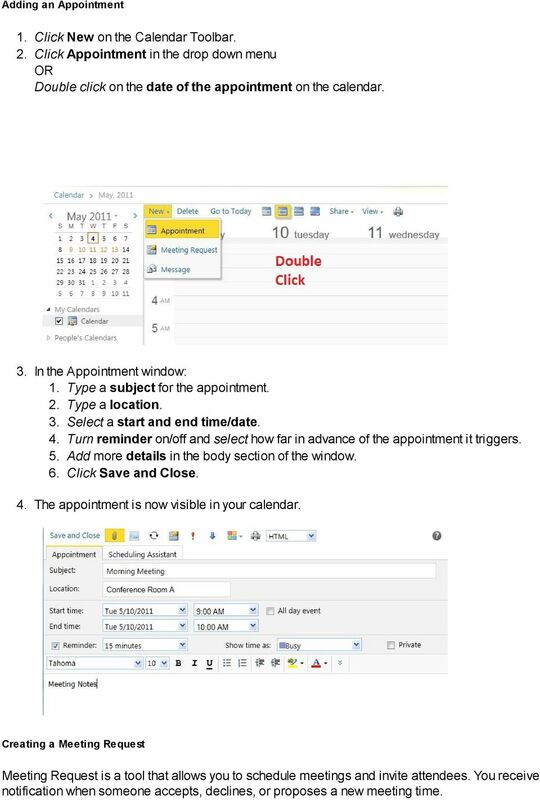 Click Appointment in the drop down menu OR Double click on the date of the appointment on the calendar. 3. In the Appointment window: 1. Type a subject for the appointment. 2. Type a location. 3. Select a start and end time/date. 4. Turn reminder on/off and select how far in advance of the appointment it triggers. 5. Add more details in the body section of the window. 6. Click Save and Close. 4. The appointment is now visible in your calendar. 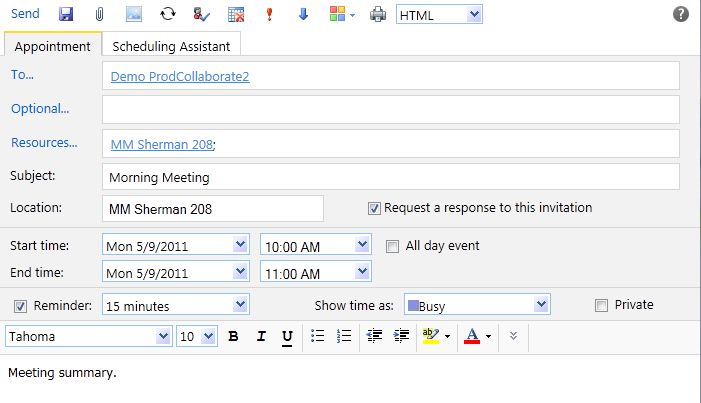 Creating a Meeting Request Meeting Request is a tool that allows you to schedule meetings and invite attendees. You receive notification when someone accepts, declines, or proposes a new meeting time. 1. Click New on the Calendar Toolbar. 10 1. Click New on the Calendar Toolbar. 2. Click Meeting Request. The new meeting window will open. 3. Type the address of people you want to invite into the To field. Click To to use the Global Address List to find attendees. 4. Type a subject for the meeting in the subject field. 5. Type a location for the meeting in the Location field. 6. Select a start and end time/date. 7. Click Send. 8. invitations will be sent to all invitees. Using the Scheduling Assistant The Scheduling Assistant allows you to check the availability of people, displaying Free/Busy indicators for blocks of time throughout the day. 1. Click New on the Calendar Toolbar. 2. Click Meeting Request. 11 2. Click Meeting Request. 3. Click the Scheduling Assistant tab. 4. 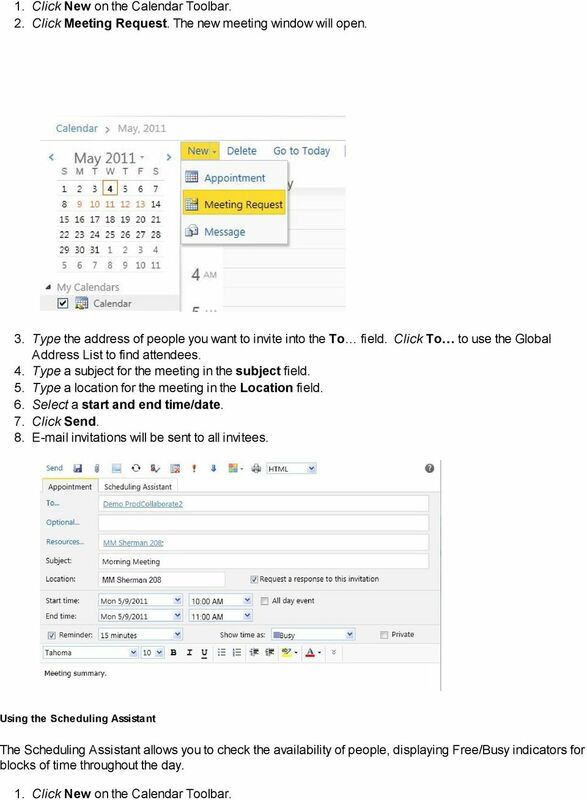 Select a start and end time for the meeting. 5. Add a name to select attendees from the Global Address List. Availability is determined by each user s personal calendar. Unavailable time will appear as a purple block in the row next to an attendee s name. You can easily see when people are available and select an appropriate meeting time. Adjusting the vertical green and red lines will change the start and end time of your meeting. The suggested times section on the right side of the screen will automatically populate with dates and times where all resources and people are available. 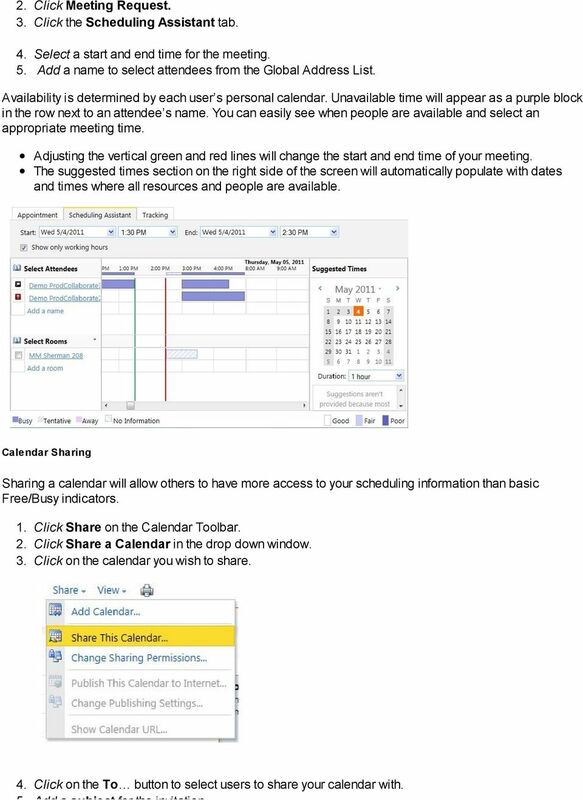 Calendar Sharing Sharing a calendar will allow others to have more access to your scheduling information than basic Free/Busy indicators. 1. Click Share on the Calendar Toolbar. 2. 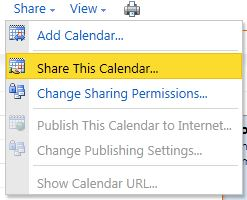 Click Share a Calendar in the drop down window. 3. Click on the calendar you wish to share. 4. Click on the To button to select users to share your calendar with. 5. Add a subject for the invitation. 12 5. Add a subject for the invitation. 6. In the Share section, click on the level of access you wish to grant users. 7. Type text into the body if desired. 8. Click Send. 9. The person(s) being invited will receive an in their inbox requesting a calendar share. In order to accept, they must click Add This Calendar. 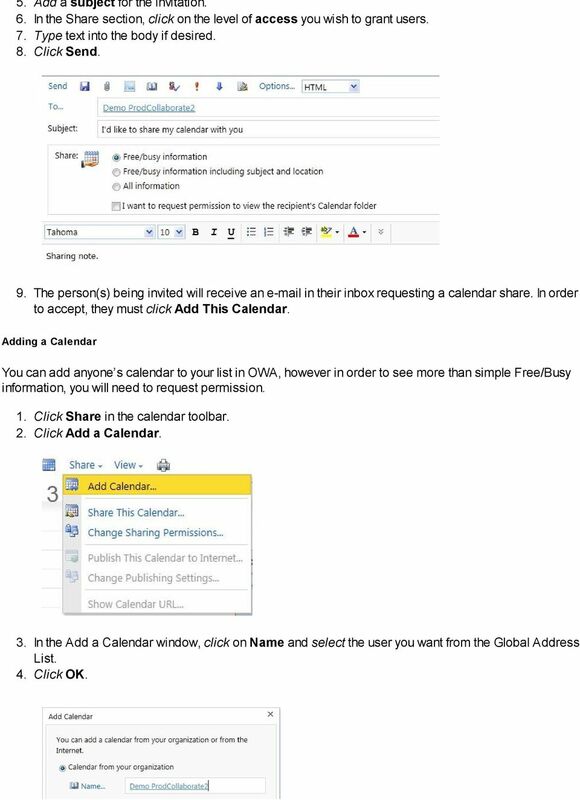 Adding a Calendar You can add anyone s calendar to your list in OWA, however in order to see more than simple Free/Busy information, you will need to request permission. 1. Click Share in the calendar toolbar. 2. Click Add a Calendar. 3. 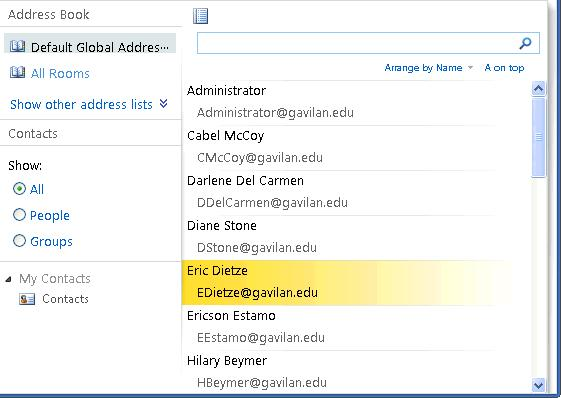 In the Add a Calendar window, click on Name and select the user you want from the Global Address List. 4. 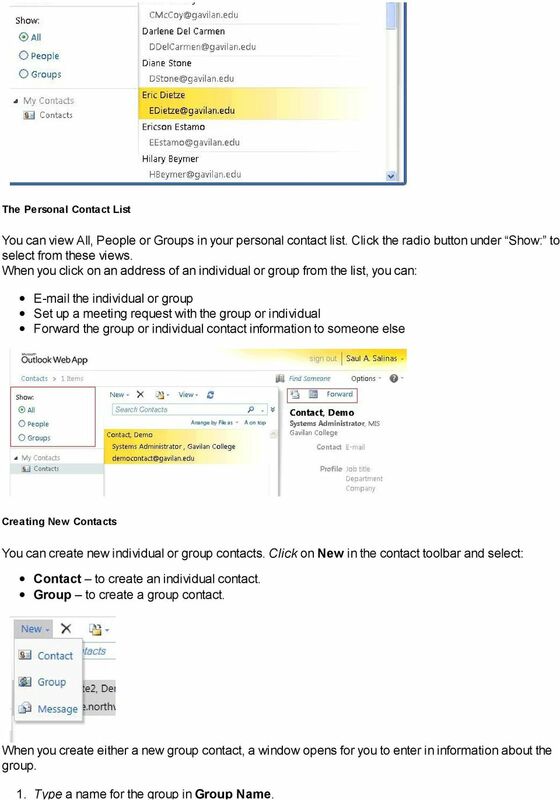 Click OK.
13 Contacts Accessing Contacts There are two ways to access contacts in OWA: The Contacts menu item in the bottom left will open your personal contacts list. The Find Someone button in the top right will open the Global Address List in a pop up window. The Global Address List The Global Address List contains all people and resources in the organization. It can be used to find contact information, invite users to meetings, and check resource availability. Click on the book icon next to Find Someone you access the Global Address List. There are a couple of different features as compared to the Contacts you open in the left side navigation. Global Address List (default) this is a list of all people in the system. All Rooms this is a list of all rooms available for booking. Show other address lists this is a list of all address books you have access to. 14 The Personal Contact List You can view All, People or Groups in your personal contact list. Click the radio button under Show: to select from these views. 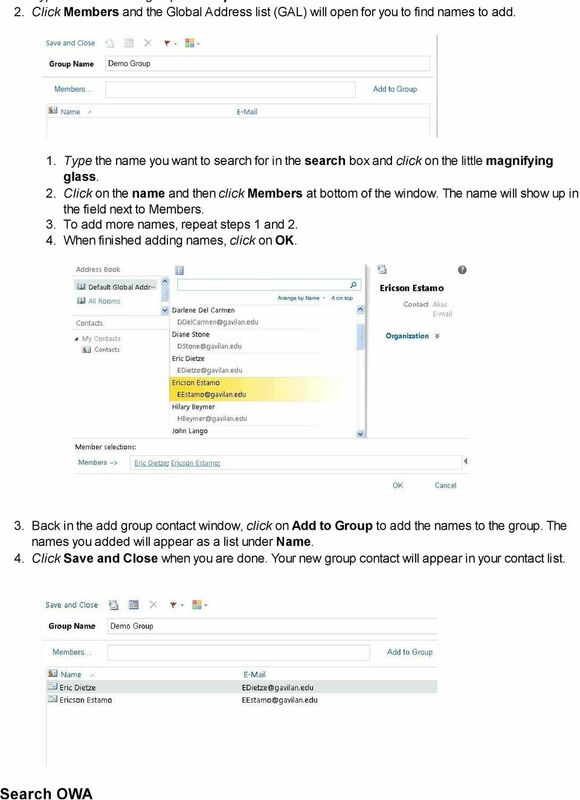 When you click on an address of an individual or group from the list, you can: the individual or group Set up a meeting request with the group or individual Forward the group or individual contact information to someone else Creating New Contacts You can create new individual or group contacts. 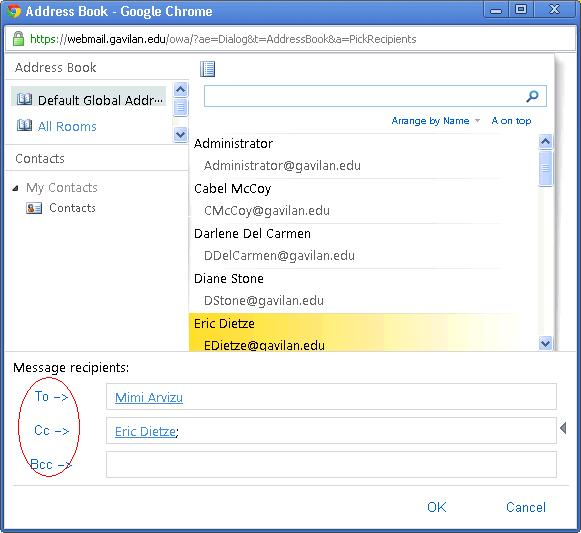 Click on New in the contact toolbar and select: Contact to create an individual contact. Group to create a group contact. When you create either a new group contact, a window opens for you to enter in information about the group. 1. Type a name for the group in Group Name. 16 Search OWA How to Search You'll find a search window at the top of the list for , contacts or tasks. If you click the down arrow next to the search box you will have several choices to choose from: This Folder Searches in folder you are in currently. This Folder and Subfolder Searches a folder and its subfolders. Entire Mailbox Searches the contents of your entire mailbox. Set Default Location Lets you choose what folder to search in by default. You can also perform advanced searching. For Advanced searching, click the chevrons to the right side of the search window to select additional options to narrow the range of your search. In Mail, you can narrow your search to the following: Results in - the subject and message body, message body only, or subject only. From - or sent to a specific person or group. Category - Items in a specific category. After you configure your search, click Enter or Search to start your search. Advanced Features Signature Adding an signature can help to ensure that meets professional standards, represents the College s business, and provides relevant information to support Gavilan s business processes.. 1. Click on Options in the upper-right portion of the screen. 2. Click See All Options in the drop down menu. 17 3. Click on Settings. 4. Type your signature in the Signature text box. 5. 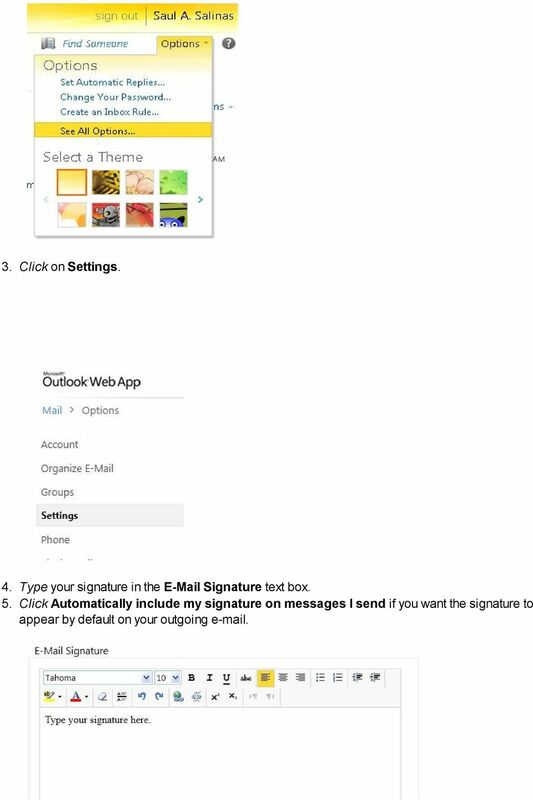 Click Automatically include my signature on messages I send if you want the signature to appear by default on your outgoing . 19 2. Click the Send automatic replies radio button and choose: 3. Select Start and End times. 4. Type a message about being out of the office, i.e. I will be out of the office from June 1-June Click Save when you are done. Set Mail Rules 1. Click on Options. 2. 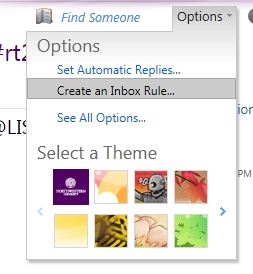 Click Create Inbox Rule in the drop down menu. 20 3. Click New. 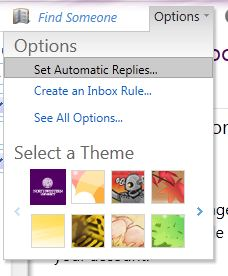 This opens the New Inbox Rule window. 4. Select a condition that triggers the rule in the When the message arrives, and: drop down menu. 5. 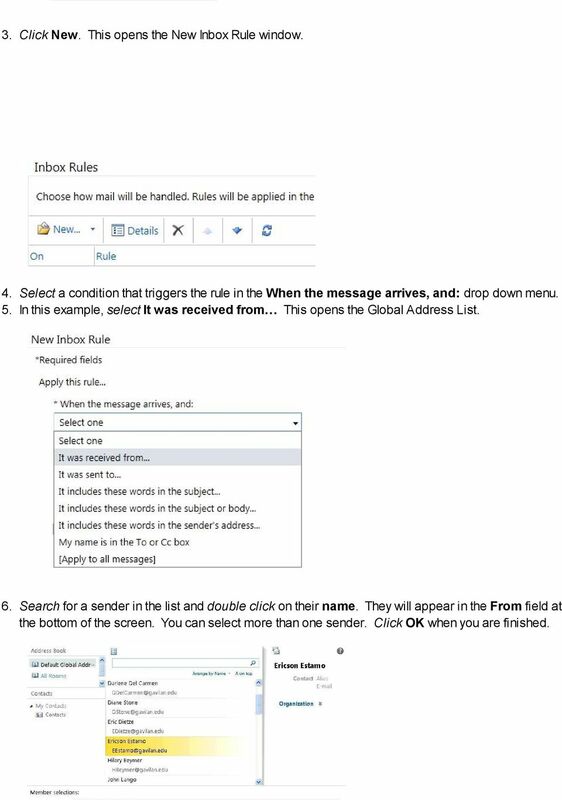 In this example, select It was received from This opens the Global Address List. 6. Search for a sender in the list and double click on their name. They will appear in the From field at the bottom of the screen. You can select more than one sender. Click OK when you are finished. 21 7. Select an action for the rule to take in the Do the following: drop down menu. 8. In this example, select Move the message to folder This opens a list of your folders. 9. Select the Folder you want in the list that appears and click OK. 10. Click Save. Your rule is now in effect. Sign Out Be sure to sign out so that no one can access your Gavilan data. Click the Sign Out button in the top righthand corner; you will then be asked to close the browser by clicking the close button. Out of Office Assistant 1. Login to OWA 2. Click Options in the top left corner then select Set Automatic Replies. 24 4. 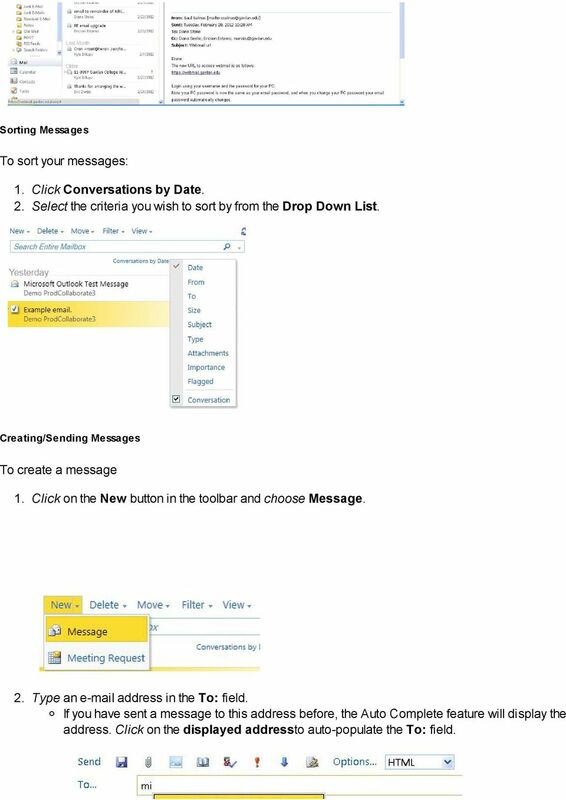 Under When Message Arrives choose [Apply to All Messages], Under Do the Following choose 'Redirect the Message to' 5. A new windows will pop-up, type in the address manually in the To Section, then click OK 6. Click Save on this screen 7. Click yes on the confirmation box, and then again on the second confirmation box. 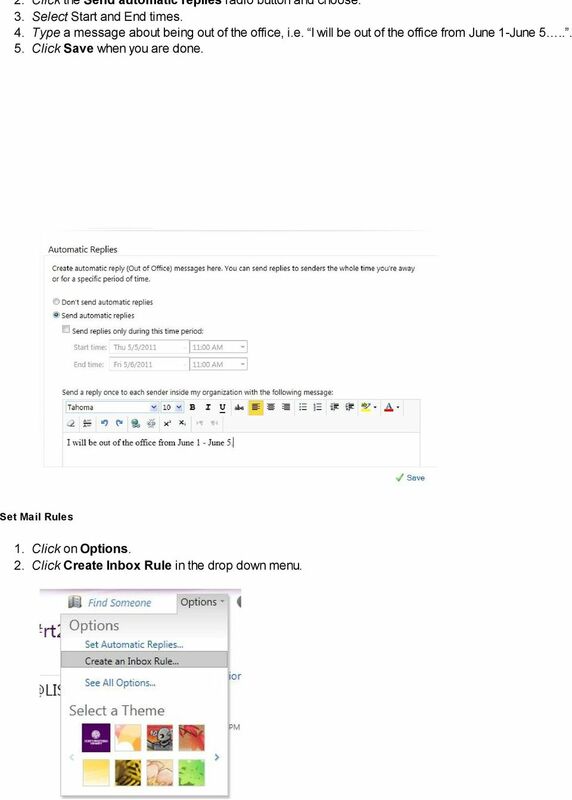 If you have previously setup rules in Outlook this could impact those and you should use Outlook to setup the rules. 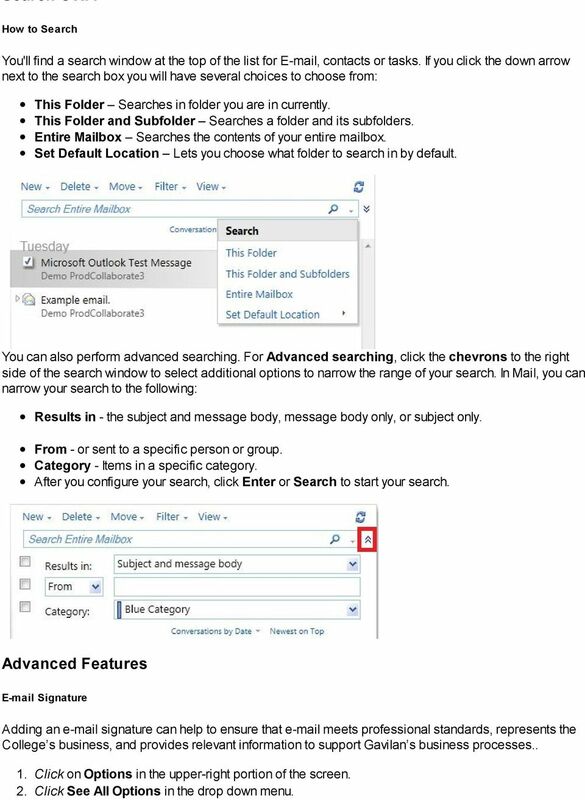 Advanced Outlook Tutorials Filtering: Create a filter to send email directly to a specific folder from a certain sender: 1. Right click on the sender s email. 2. Choose Rules. 3. Click on Create Rule.